Every year, Hollywood’s major studios use the annual summer movie season to bring audiences its biggest cinematic offerings. However, if reactions to many of the prequels, sequels, reboots, and spinoffs being churned out in recent years is any indication, those studios do not and have not had much to offer audiences in the way of anything original. Thankfully the independent studios out there have clearly picked up the slack from their more well-known counterparts. They have done so in quite impressive fashion, too. Movies such as Butter (2011—The Weinstein Company), The Decoy Bride (2011—IFC Films), Shanghai Calling (2012—Anchor Bay Entertainment), My Uncle Rafael (2012—World Entertainment Connections), Life’s A Breeze (2013—Magnolia Pictures), The Voices (2014—Lionsgate), A Bet’s A Bet (2014—Cinedigm), and so many others have proven time and again in recent years just how much the independent movie industry has to offer audiences. Now independent studio Level 33 Entertainment has strengthened that argument even more with the U.S. release of Spike Island this past May. Spike Island is a powerful coming of age story that centers on a group of five young men trying to get their band’s demo tape to their favorite band, The Stone Roses. The display of the boys’ personal growth throughout the movie will at times move viewers to smile and laugh, and at other times cry. That ability to so easily keep audiences engaged and in turn move them so much says plenty of the writing behind this movie. It in turn makes the writing the key element to note of the movie’s success. Writer Chris Coghill’s script makes for plenty of reason for audiences to check out Spike Island. It is not, however, the only reason that audiences will appreciate this movie. The movie’s casting plays a dual role in its success. That dual role includes the very fact that the movie’s cast is in fact made up of actual teens instead of older actors trying unsuccessfully to portray teens, and the its members’ collective talents. Last but hardly least of note that makes the home release of Spike Island surprisingly interesting is its bonus material. The standard behind-the-scenes/Making of featurette is there. The standard cast interviews are interesting. That’s given. But most interesting to note of the bonus material are the “Shadowcaster Studio Session” and “Zippy Drumming” footage. Both of these elements show that the movie’s young cast members did in fact perform rather than pretend as if they were playing in a music video. This is a rarity when it comes to movies involving actors performing to that extent. So, it is nice to see and hear this approach used here. It is through this element as well as through the movie’s script, and casting that Spike Island proves in the end to more proof of the importance and value of the independent movie industry especially considering the current state of the mainstream movie industry. Level 33 Entertainment’s new drama Spike Island is one of the best movies that the independent studio has released to date. It is another example of the increasing validity of the independent movie industry and its equally growing importance when compared to that of Hollywood’s major studios today. It proves this primarily through its script, which was crafted by screenwriter Chris Coghill. The script presents a story that centers on a group of young musicians living in Manchester, England that have dreams of being superstars. And their way of trying to hit it big is by going to see their favorite band, The Stone Roses, at an upcoming performance at Spike Island. Now it goes without saying that this is not the first time that any writer has ever used such a plot for a movie or even episode of a television program. However, Coghill did more than just make what would have otherwise been another stale, trite comedy. Rather he incorporated a much more dramatic element into the story to make it a work that will move audiences just as much as it will entertain them. The element in question is a balance of the boys’ sense of self-importance and the reality of their naivety. At no point does Coghill try to go over the top with this balance. Instead he makes certain to make them one hundred percent relatable to his viewers. This includes the attention paid to the boys’ having to balance the trials and tribulations of their personal lives with the happenings of their own intersecting lives as a “band.” Such a realistic plot and equally realistic portrayal of the story’s characters through the movie’s script make Spike Island’s script quite the impressive work and a solid foundation on which the rest of the movie’s elements rest. The second of those elements in question is its casting, speaking of the story’s characters. Chris Coghill’s work on the script for Spike Island is exceptionally impressive to say the very least. Thanks to his creativity he has taken in his script a rather standard coming of age story and made it into a work that stands out from so many other works within that genre. For all that the script does for Spike Island it is just one of the movie’s positives worth noting. The movie’s casting does just as much for its success as its script. Its casting actually proves in not but two ways why it is so important to the movie. The central way in which it proves so important to the movie is the very fact that the cast is actually a group of teens. Casting director Jane Ripley is to be commended for paying attention to Coghill’s script and making sure to make the cast not only the proper age for the story but was talented, too. It would have been so easy for Ripley to take the easy road and bring in a group of older actors and have them play younger characters as far too many studios do. Thankfully she opted to not take that route. Being that she took the high road and actually brought in a group of teens to fill out the story’s roles, it made the story that much more believable. The collective talents of the cast in their roles took that believability and stepped it up even more. It is clear in watching this movie just how seriously the cast took its roles. Just as it would have been so easy for Ripley to take the easy road in casting the roles, it would have been just as easy for the cast to take the easy road and play up the teen stereotypes. But not one member of the cast did that. The result of that serious approach is a group of performances that is entirely believable and that audiences will in turn want to watch. It is yet another reason that audiences will agree that Spike Island is one of this year’s best new independent movies. The work of writer Chris Coghill and that of Spike Island’s cast (and of casting director Jane Ripley in having chosen the movie’s cast) are both equally important to the success of this surprisingly entertaining and deeply touching story. While both elements play their own important part in the movie’s success and enjoyment, there is still one more element to note in that success and enjoyment. That final element is the movie’s bonus material. The standard “making of” featurette is there. And it goes without saying that getting to hear from the movie’s cast and crew adds its own extra insight into the movie. But most interesting to note of the bonus material are the “Shadowcaster Studio Session” and “Zippy Drumming” footage. Both of these bonuses go to show that the movie’s young cast actually was performing in the given segments. They weren’t just performing to some pre-recorded work as if they were in a music video. That is made especially clear as audiences get to see Zippy (Jordan Murphy) handling drumming duties. Murphy really holds his own, too as he performs. This is so important to note because so few movies that include musical numbers actually feature their casts performing the music. Being that this movie’s cast did in fact perform its given parts makes suspension of disbelief that much easier. It also serves to once again prove the importance of bonus materials in a movie. It shows that bonus material can make an otherwise forgettable movie into something worth the occasional watch, a good movie into an even better movie and a great movie into something even greater. In the case of this movie, these two bonuses come together with the work of the movie’s script and that of its cast (and casting director) to make it one of this year’s great independent movies. And in all honesty, they make it potentially one of this year’s best movies considering the lackluster offerings by Hollywood’s major studios so far this year. Indie film studio Level 33 Entertainment will finally bring its new movie Spike Island home later this month. 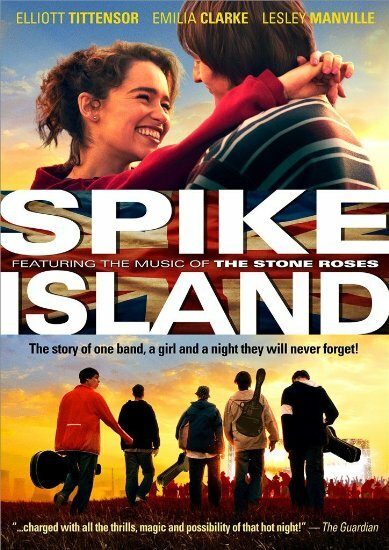 Level 33 Entertainment announced this week that Spike Island will be released in stores on Tuesday, June 23rd. The movie is a coming-of-age piece that centers on young wannabe rockers who come up with a plan to get their demo tape hand-delivered to their favorite band The Stone Roses. Their hopes are that the Stone Roses will hear the band’s music and help them kick start their dreams of stardom. The catch is getting in to the band’s upcoming show at Spike Island, a 103-acre island that lies in Cork Harbor, Ireland. The problem is that the friends’ tickets never appear. So they take off on a road trip with a plan to sneak into the show. The journey to the show tests the friendships of the young band leading the young rockers to come to some tough realizations and make some equally tough decisions. Spike Island was written by Chris Coghill and directed by award winner Matt Whitecross (Winner—Independent Spirit Award for The Road To Guantanamo). It was nominated for a British Independent Film Award for Most Promising Newcomer (Elliot Tittensor—Shameless, The Selfish Giant, Slap) and features the music of The Stone Roses. Speaking of Tittensor, he stars alongside Emilia Clark (Game of Thrones, Terminator: Genysis, Don Hemingway), Lesley Manville (Maleficent, Another Year, Law & Order: UK), Rob James-Collier (Downton Abbey, Coronation Street, Mercenaries), Kaya Scodelario (Moon, The Maze Runner, Clash of the Titans), Adam Long (The Thirteenth Tale, Happy Valley, The Passing Bells), Oliver Heald (Shameless, The Messenger), Antonia Thomas (Survivor, Misfits, Sunshine on Leath), Michael Socha (Being Human, Once Upon a Time, This is England), Jordan Murphy (The Passing Bells, My Mad Fat Diary, Marvellous), and Nico Mirallegro (Hollyoaks, Common, Anita B. ).